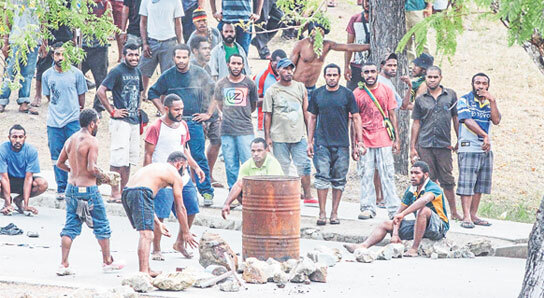 A group of students at the University of Papua New Guinea burnt five vehicles during a row with security guards, prompting a recall of police to the Waigani campus to restore order, the National reports. But Vice-Chancellor Dr Nicholas Mann described the incident as “small” and unrelated to the on-going protest and boycotting of classes by some students on campus. He said the situation on campus was calm. Assistant Police commissioner Sylvester Kalaut talked to the students after the incident. He also met with the Higher Education secretary, and the UPNG chancellor and vice-chancellor yesterday. They plan to meet with the students today at the campus to resolve the issues. Mann said the row yesterday stemmed from the sale of betel nut on campus which the security guards had objected to. “This incident has nothing to do with the protest or the boycott of class,” Mann said. “The situation on campus is calm and the administration is looking forward to reconciling with the students and concentrate on salvaging the academic year. At the moment, I cannot blame the students or the security guards or anyone because I don’t know who is responsible for the incident. He said the university council was concerned about such “irresponsible acts, but we will have to get the full report first, understand the incident and appropriate disciplinary actions will be taken against those responsible”. Student Representative Council president Kenneth Rapa told The National that he was not aware of the incident. “I have no idea about that incident and I don’t know what’s the cause. I am out of campus and I don’t have any idea on that,” Rapa said. Kalaut said the (Uniforce) security guards had tried to confront students who were selling betel nuts in the campus. He clarified that the matter was internal and police were called in just to monitor the situation. Kalaut said the previous issue two weeks ago which resulted in students being shot was still unresolved. NCD Metropolitan Superintendent Benjamin Turi said the behaviour of the group of students was criminal in nature.